This book is meant to provide a scientific and educational guide for researchers, language professionals and students of applied linguistics. 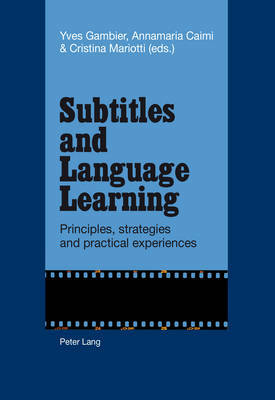 The collected articles incorporate past and recent research on the use of subtitles as foreign language learning tools, and describe some interesting teaching/learning experiences carried out by university scholars and school teachers to test the effects of subtitles/subtitling in tutored or untutored foreign language learning contexts. It provides examples with didactic feedback on the use of interlingual, intralingual and reversed subtitled audiovisuals from the early eighties up to 2013. The opportunities offered by such multimodal, inter-semiotic learning aids are acknowledged to facilitate self-study and promote digital literacy, yet the pedagogical context, be it physical or virtual, always plays a prominent psychological role which affects foreign language acquisition.